The image of Aylan Kurdi's body washed up on the Turkish shoreline changed the way social media users talked about the issue of immigration, according to a new report. 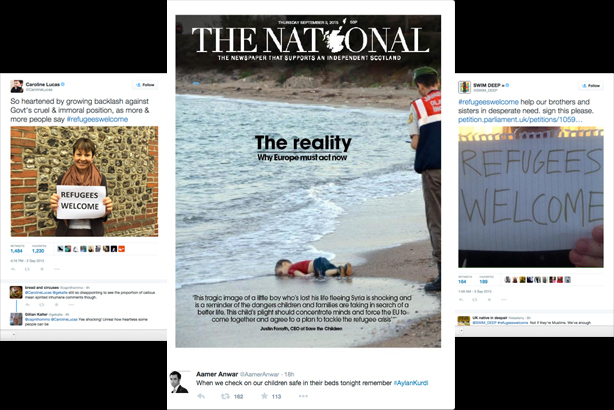 Researchers from the University of Sheffield and Google's News Lab analysed almost three million social media posts following the publication of the recovery of the young refugee’s body from a beach in Turkey, to understand how it became one of the most iconic image-led news stories of our time. The report shows how social media transported images of Aylan from a beach in Turkey to the screens of almost 20 million people across the world in the space of just 12 hours. Researchers also identified a sudden shift in the way people were talking about migration on social media. Francesco D’Orazio, co-founder of the Visual Social Media Lab and co-author of the report, said: "For most of 2015, the use of the words migrants and refugees was head to head in public conversation, accounting for pretty much the same volume over nine months – 5.2 million tweets versus 5.3 million tweets. From 2 September onward this radically flipped. The numbers swing dramatically towards a clear focus on refugees – 2.9 million tweets and 6.5 million tweets." The report highlights the key role Twitter played in shaping the world's news agenda after journalists on the ground broke the story through the social platform. Claire Wardle, research director at the Tow Center for Digital Journalism at Columbia University and one of the report’s authors, said: "In April, more than 700 refugees and migrants lost their lives when their boat capsized off Lampedusa. After one day of coverage, the story disappeared, despite the tragic loss of life. "The photo of Aylan Kurdi galvanised the public in a way that hours of broadcasts and thousands of column inches wasn't able to do. It has created a frame through which subsequent coverage has been positioned and compared." The report was written by researchers from the University of Sheffield’s Visual Social Media Lab, social media data platform Pulsar and the Google’s News Lab data journalism team in California.